For tonight's season finale (*tear*), I chose to present Rachel's cupcake. 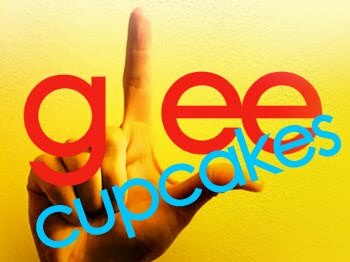 I am always sad when the show goes on break or the season ends, but this time I am also excited, as I will have all summer to dream up awesome Gleecakes (thanks, Kelsey!) for the rest of the gang, including Finn, Quinn, Puck, Santana, Brittany, Artie, Sam, Sue, Mr. Schue... maybe even a (crazy)Gleecake for Terri? 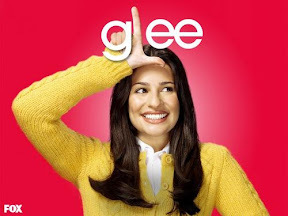 Rachel is an exceedingly driven member of the student body at McKinley High. She wants nothing more in life than to be a star (well, aside from gaining the affections of Finn). She lets nothing stop in her way of getting as much exposure as possible - from always speaking her mind on any Glee club matter, to securing television commercials for the group, to demanding solos in competition. Rachel is consistently reminding us that stars are her signature icon, so incorporating stars into her cupcake was a given! As Rachel would most surely attest that she is naturally uber talented, I chose a starfruit, with it's natural star shape, to adorn sparkly buttercream topped cupcakes. However, I also couldn't resist hiding a star inside the cupcake because, really, how much fun is this?! Rachel's Star-Berry Cupcake combines vanilla cake with a surprise strawberry star baked inside, topped with strawberry swiss meringue buttercream, silver pearl dust, and sliced starfruit. Preheat oven to 350 degrees and prepare one 9" or 8" round cake pan by spraying with baking spray. Sift flour, salt, and baking soda in medium bowl. In bowl of mixer, cream butter and sugar until fluffy. Add eggs and mix until combined. Add buttermilk, oil and vanilla until combined. Add flour mixture and stir until just combined. Stir in chopped strawberries and ground freeze dried raspberries (or food coloring, to desired shade of pink/red). Pour batter into cake pan. Bake for approximately 25-30 minutes, or until a toothpick inserted into the center comes out clean. Cool cake in pan on wire rack for 10 minutes. Remove cake from pan and continue to cook on wire rack until thoroughly cooled. Wrap well in plastic wrap, and freeze for at least 2 hours to prepare cake for cutting. Once frozen, use a small star cookie or fondant cutter to make star shaped pieces of cake. Use immediately or store, well wrapped, in freezer until you are ready to continue with the cupcakes. Preheat oven to 350. Line one muffin/cupcake baking pan with 12 cupcake liners. Set aside. In a medium bowl, sift together the flour, baking powder, and salt. Place butter in the bowl of a stand mixer, fitted with a paddle attachment. Beat for 3 minutes on medium-high speed until the butter is light and creamy in color. Stop and scrape the bowl. Cream the butter for an additional 60 seconds. Add the sugar, 1/4 cup at a time, beating 1 minute after each addition. Scrape the sides of the bowl before each addition. Add the eggs one at a time. Reduce the mixer speed. Stir vanilla into the buttermilk. Add the dry ingredients alternately with the buttermilk. Mix just until incorporated. Scrape the sides of the bowl and mix for 15 seconds longer. Add roughly 2 tablespoonds of batter to each cupcake liner. Place one frozen strawberry cake star in the batter, standing up and all facing the same way. (Remember which way stars are placed, so that decoration added to the top of the cupcakes at the end can signal which way to cut/eat the cake to reveal the star.) Continue to add vanilla batter to each cupcake liner, making sure to cover the stars. Let cool completely in the pans. While baking and cooling, prepare buttercream. Frost cupcakes with buttercream, sprinkle with pearl dust, and top with sliced starfruit. Add egg whites and sugar to a heat-safe bowl. Place bowl over a pot of simmering water and whisk lightly until the muixture reaches 140 degrees F and the sugar is dissolved. On your mixer, remove the whip and attach the paddle. Add half the butter into the bowl immediately and pulsate the mixer several times until the meringue has covered the butter completely. To pulsate the mixer, turn it on and off in a jerky motion. This forces the butter on the top to the bottom of the bowl. Add the balance of the butter and pulsate mixer several times. Slowly increase the mixer's speed, starting with the lowest speed and increase the speed every 10 seconds until you reach a medium-high speed. Continue beating until the mixture begins to look light and fluffy. Stop the mixer and scrape the bowl. Reduce speed to low. Add vanilla and 2 tablespoonds of strawberry puree and continue to beat on low speed for 45 seconds. Then beat on medium-high speed for an additional 45 to 60 seconds. Add additional puree, if necessary, to acheive desired color and taste. If frosting gets too soft, powdered sugar can be added to help stiffen it back up. Note: Leftover buttercream can be placed in plastic containers with lids and kept in the freezer for up to 3 months. Defrost completely (several hours) and rewhip before using. Storage: Store the icing in an airtight container and freeze for up to 3 months. OMG, so cute! Love the stars inside, and the starfruit topping is absoultely perfect! :) Definitely a cupcake that Rachel would adore! These are so perfect! You certainly do think about every detail--the star, the colors, the berry, the luster dust. Perfect! Thanks for the Gleecakes shout out! I certainly wasn't expecting that. That is SO COOL, and so GLEEK-tastic! Your cupcakes are so pretty! LOVE seeing what you come up with--you are incredible! What a fabulous idea with the hidden star! Did you notice any kind of textural (is that a word) difference? Glee! Vote for the next cupcake!